We have often written about how people love to use their own language and how machine translation is often good enough for understanding foreign language text. 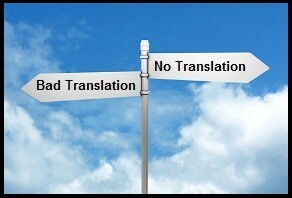 Although less perfect translations are valuable sometimes they are not suitable for all situations. There are at least two obvious cases when a bad translation is potentially more harmful than no translation at all. Firstly, online stores may be better off without a bad translation. Depending on the industry, e-commerce sites with low quality localization won’t feel trustworthy. When money is involved the quality is important. One typo won’t kill the business but too many mistakes make the seller look either sloppy or unreliable. When the goal is more than just delivering a message, low quality translation may not be a good idea. Understanding the message doesn’t guarantee that the reader would actually buy the idea. People tend to look at all sorts of things when they decide whether they can trust the seller. When the goal is to persuade new customers the attention to all details is often worth the time and money. Secondly, a bad translation can be misleading or even fatal in safety and other important instructions. Even the smallest translation mistake can change the message totally. While long texts explain things more, instructions are often very short. When reading long text which has some translation mistakes the reader can reason the core message out of the context. In short text one translation mistake can distort the whole message. Road signs, information boards and safety instructions are supposed to help people to avoid accidents and to keep them safe. To minimize the risk of mistakes, nowadays these kinds of message are often visual and uniform. At least these two cases require attention to the translation quality. When safety and property are in the line people are either more focused or expect responsible behaviour from others. Do you know other situations when bad translation is worse than no translation? Please share you thoughts and leave a comment below.